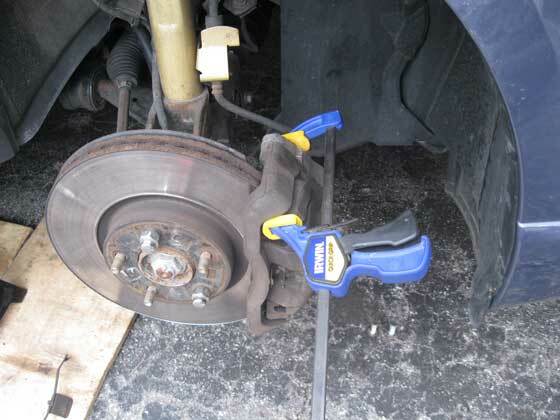 The following is a step by step guide to replacing the front rotors & brake pads on a 2007 to 2009 Mazdaspeed3. Note that the front brakes on the Mazdaspeed3 are completely different and much bigger than those on the rest of the Mazda3 line. It appears that Mazda got the parts from the Volvo parts bin and it's important to note that the pads are absolutely not compatable with those for any other Mazda. I'm stating this explicitly because two different stores I went to (Canadian Tire and NAPA) both had their computers tell them that the MS3 used the same pads as the Mazda3 GT. If you're buying pads and you don't already know the part numbers you're looking for, please have the store do another search for the Mazda3 GT and ensure they're not the same part numbers. Clamp. See instructions below. My pad separator tool would not work. 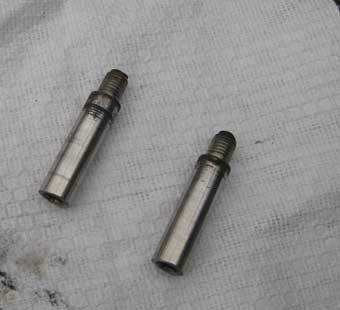 Front Caliper Pins: 19-22 ft-lbs. Front Caliper Bracket: 58-75 ft-lbs. Ensure that the car is in gear and the parking brake is on. Using a flat-head screwdriver pop off the spring clip. The spring clip may fly off with some force, so beware. I would hate for you to lose an eye to an errant spring clip. Find the two plastic dust caps that are snapped over the back of the slider bolts and remove them. The top one is shown here circled in green. Use the 7mm allen/hex key to loosen the caliper slider bolts that are behind the dust caps. You don't need to pull them out just yet. 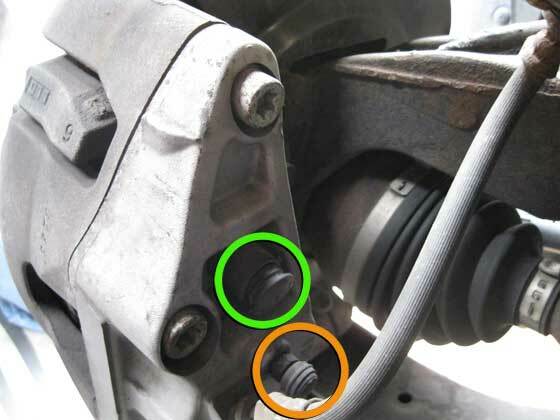 Note: To bleed the brake when changing pads, the bleeder valve is circled in orange. Now remove the two 17mm bolts that are holding the caliper in place. They are circled in green. You can also see the lower slider bolt here with the dust cap removed. Now you may be able to slide the caliper off of the rotor. Note that I've put a couple lug nuts in place to hold the rotor while pulling off the caliper. 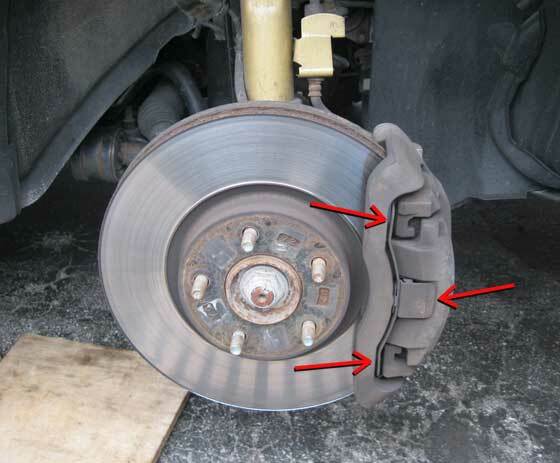 You may find this useful if removing the caliper is giving you issues. 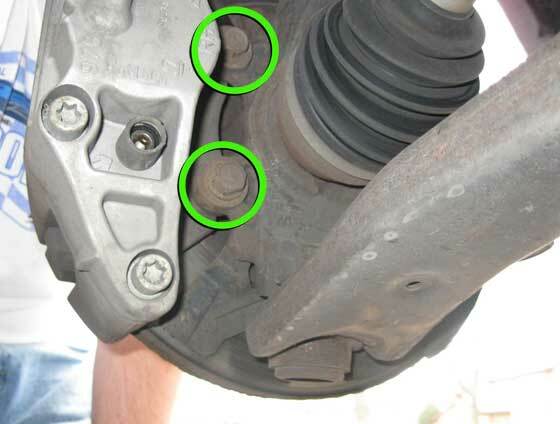 If you are having difficulty sliding it off, the pads may be caught on the lip that's left on the worn rotor. Using a clamp, I was able to press the pad carrier in to give myself a little slack to be able to remove it easily. Try pressing it at the top and bottom a few times and then remove the clamp before trying to pull it off again. Note that I expect this to be more difficult the next time I do this, as the rotors will be worn down twice as much. Since I will be due to replace the rotor, I'll probably just grind off the lip a bit to make it easier to remove the caliper. Just some food for thought if you find yourself in a real bind here. 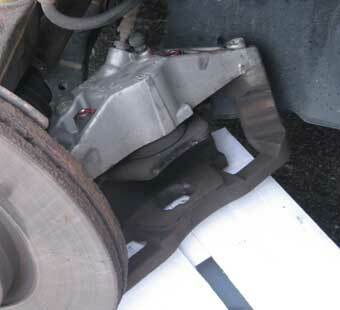 Once you get the caliper free, be sure to either hang it from a bungee or wire, or have something solid to place it on. It's quite heavy so you don't want to just hang it from the brake hose. You can see below that I've placed it on a box. Both pads are clipped in place and simply pull off with a little effort. 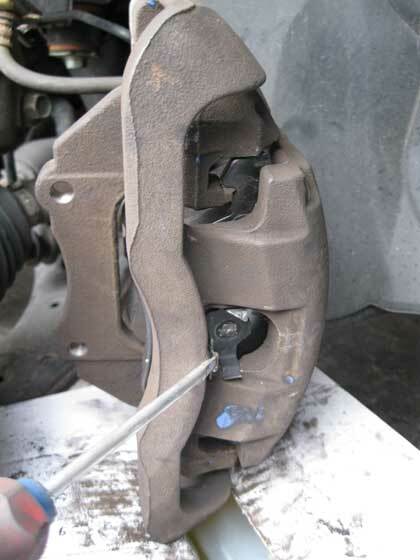 Remove the outside pad and, for the moment, leave the inside pad clipped to the caliper piston. With the outside pad removed and the slider bolts undone, you can now remove the caliper bracket. It will fall right out if the slider bolts are fully undone. Push out the slider bolts from the inside. Clean them with brake cleaner, dry them thoroughly, and coat them with a bit of brake grease (any grease that says it's suitable for brake parts). Push them back in place. In this pic, you can see they've been lubed up with a bit of red grease that came with my new pads. The rotor should now be free, so just pull it from the hub. If the rotor doesn't come off easily, it is probably just rusted on (or you've left the lug nuts on that you placed earlier). Using a mallet, just tap the along the circumference of the center part of the rotor to jar the rotor free from the hub. Slide on the new rotor, and hold it in place using a lugnut or two. Holding it on like this isn't critical, but it is convenient for helping line up the caliper when you're putting it back on. Now you need to compress the caliper piston. 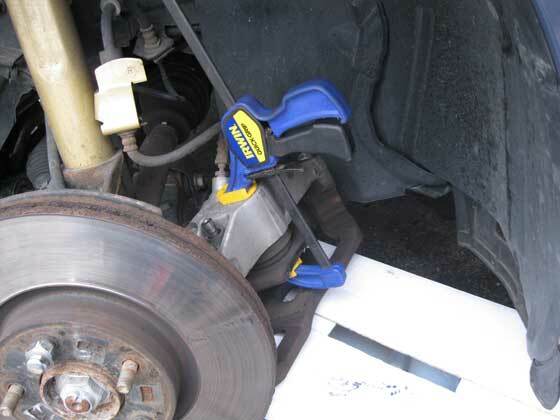 To do so, take the lid off the brake fluid reservoir and ensure that it is not full to the top. If fluid has been added, this may be the case and some may have to be removed. When the piston is pushed back in, the fluid level will rise and you absolutely do not want to spill any. Brake fluid is extremely corrosive to paint. With the old pad still in place over the piston, use a clamp to push the piston back into the caliper. I expect this will be easier with a c-clamp, but it also worked with the clamp you see in the picture. It was just a bit slow-going as there's not a lot of force with those. Note that neither of my caliper piston tools had handles that would fit through the hole in the caliper, so they weren't of any use to me here. That's a shame as those tools make pressing in caliper pistons extremely easy. Remember to check the fluid reservoir with every few compressions of the clamp to ensure it's not overfilled. With the piston pushed in, you can now install the new pads. First clip the inside pad onto the piston. Be careful not to gouge the rubber seal with the clips. I found they took a bit of coaxing to get in place and it would be easy to slip and jam them into the rubber. Then put the caliper bracket back in place and secure it with the two slider bolts. If you've pushed those bolts all the way in after you cleaned and lubed them, push them back out enough to fit the bracket in place and then tighten them down to 19-22 ft-lbs. Be sure to put push the two dust caps back in place. This pic shows the new pad and bracket back in place. Now clip the outside pad into place. You'll find it useful to use a screwdriver to press in this clip while putting the pad in place as shown here. With everything now in place, you can slide the caliper back over the rotor and secure it by tightening the two 17mm bolts to 58-75 ft-lbs. The caliper should slide over the rotor very easily. If it doesn't, then either the pads aren't properly in place or you didn't push the piston back in far enough. Put the wheel back on and torque your lugnuts in a star pattern to 80-90 ft-lbs. Remove the jackstands and lower the car. 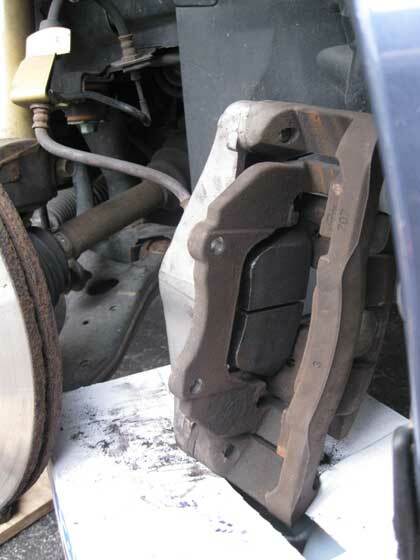 Finally, before starting the car, be sure to pump the brake pedal until it firms back up. Then, pump it a few more times after starting the car. Remember that your pads are doing to need time to bed in, so drive cautiously for the first few hundred km's after installation until they get bedded in and provide full friction. That's all there is to it. Happy motoring!